To quote one of our staff members: “I don’t know what that means exactly, but …. 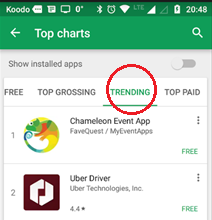 cool!” Our Chameleon Event container app was at the top of the trending list in Google’s app store – Google Play. This can be compared to having the #1 book in Amazon’s book department. So, YES, it is pretty cool! Add a POP-UP to your Home page or Menu button! Do you have a message you need to get out or sponsor you’d like to give more visibility to? Pop-ups are the answer! Assign a pop up to appear immediately upon opening the app or assign it to a specific button. Use a logo or a custom graphic for a Welcome message, to promote a sponsor or for instructions. Anything you like! Use this as additional revenue for your own event. Add a la carte options for increased visibility via pop up advertising. Our pop ups are designed to show once to your audience, to not be overwhelming or annoying. Users can dismiss them and never see them again. See more information and sample screenshots at https://myeventapps.com/pop-ups/ . Should you have any questions, send Marie-Louise an email or give her a shout at 613-818-8854. ← February 2018 Newsletter – MyEventApps has a new engine for your app!